Accepta 8710 is an innovative formulation solution used to generate high purity chlorine dioxide using Accepta’s high performance Activ-Ox Simplicity chlorine dioxide generating system. Accepta 8710 is used in-conjunction with Accepta 8708 (activator) and the Activ-Ox Dosing System. Accepta 8710 is a unique product which through a controlled reaction releases the ‘active oxygen’ power of chlorine dioxide to disinfect and maintain the microbial quality of drinking, domestic and cooling water systems. It can also be used for odour control and to remove iron, manganese and sulphide from solution. Chlorine Dioxide is an extremely effective anti-microbial agent which has significant advantages over traditional chlorine based biocides, but has to be handled with extreme care because of its toxic and potentially explosive nature. 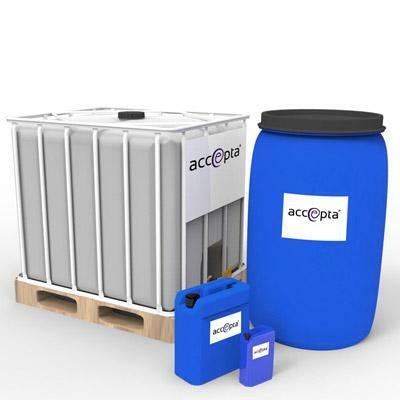 Accepta 8710 is a stable, easy to handle solution which when used in conjunction with the Activ-Ox Simplicity generator system provides all the benefits of chlorine dioxide with none of the problems.When compared with any other means of generating chlorine dioxide the Activ-Ox system is the only system which can provide instant activation and total control. The biocidal power of Accepta 8710 only becomes available on reaction with the system activator, Accepta 8708 chlorine dioxide release agent. 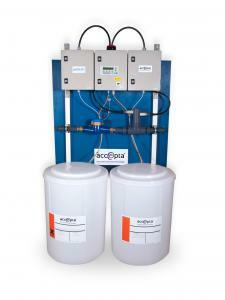 Where continuous dosage is required a Activ-Ox chlorine dioxide generating system should be used. Storage tanks and domestic water services should be disinfected using 2.5L/m3 of system volume Accepta 8710 and a similar volume of Accepta 8708. The system should be left for a minimum of one hour before flushing out. Alternatively, for large tanks spray disinfection may be employed using a solution containing 5L/m3 of Accepta 8710 and Accepta 8708. Cooling towers and evaporative condensers should be disinfected by maintaining 25ppm of chlorine dioxide in re-circulation for a period of one hour before and after cleaning. Accepta technical support can advise on the correct procedure. The quality of drinking water can be maintained by continuously dosing Accepta 8710 and Accepta 8708 to provide a maximum concentration of 0.5ppm total oxidant as chlorine dioxide at outlets of the system. Accepta technical support can advise on the correct dosage levels. For non-drinking water applications such as domestic hot water services dosage rates may be increased to provide increased protection against Legionella Pneumophila. Cooling towers and evaporative condensers should be dosed to maintain 0.2 to 0.5ppm chlorine dioxide in re-circulation. The residual oxidant level can be easily monitored with a simple Accepta test. It is recommended that in all continuous dosing applications an Activ-Ox dosing system is used to ensure the correct application and maximise the benefit of this innovative product. For further technical assistance concerning dosage rates for Accepta 8710 please contact Accepta technical support.